Corrosives are materials that have the ability to dissolve and destroy body tissue, metal and other materials. Corrosive materials can cause damage to the human body as soon as contact is made with skin, eyes, the digestive tract, or the respiratory tract. Some corrosive materials can be toxic and cause permanent health problems. Before handling, storing or transferring corrosive materials be sure to analyze the Material Safety Data Sheet (MSDS) associated with each chemical, as well as the labels illustrated on the container for warnings and other health effects. When handling, storing or transferring corrosive chemicals, personnel protective equipment (PPE) should be worn at all times. Corrosive materials can severely irritate, or burn skin, eyes and the inner lining of the nose, throat, and lungs, if inhaled. In serious cases of inhalation, corrosive vapors are known to be fatal. Acid and corrosive storage lockers by US Chemical Storage. Corrosive chemicals can cause harm to the human body from splashes during transferring, mixing or diluting chemicals, spills while transporting containers, leaking containers and vapors from open or leaking containers. The most common types of corrosives are either acids or bases. Both types of corrosive substance have the capability of inducing a chemical burn. The severity of a chemical burn depends on the concentration of the corrosive substance and the duration of contact, liquid or vapor form. Acids and bases must be stored separately. Storing incompatible materials together could lead to violent chemical reactions including a fire or explosion. Segregate incompatible materials using different storage lockers or in the same acid and corrosive storage locker by using a solid partition wall to eliminate the possibility of a chemical reaction. 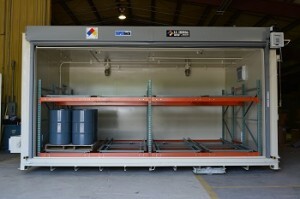 Contact us online or call 888-294-2729 for a free chemical storage consultation.